Objectives: To report the clinical features and outcome of 24 Brazilian patients with optic neuromyelitis syndrome (ONM); discuss the underlying pathological events associated with the ONM syndrome; review the nosological situation of ONM in the group of inflammatory and demyelinating diseases of the central nervous system. Patients and Methods: Patients with ONM treated at the Hospital da Lagoa, Rio de Janeiro were studied. Demographic, clinical, magnetic resonance imaging, cerebrospinal fluid, and pathological data were analysed. Results: The study consisted of 20 women, four men of whom 10 were white and 14 Afro-Brazilians. Clinical course was recurrent in 22 cases and monophasic in two. Neurological manifestations at inclusion were: sensory impairment (66%), bilateral (41.6%) or unilateral blindness (20.8%), paraplegia or quadriplegia (37.5%). The EDSS was moderate/severe in 70.8%. The underlying pathological events were respectively pulmonary tuberculosis and upper respiratory infection in the two monophasic cases; in the 22 recurrent ONM patients: pulmonary tuberculosis (3), neurocysticercosis (1), polyarteritis nodosa (1), antinuclear antibody and rheumatoid factor (1), antiphospholipid antibody primary syndrome (1), diabetes mellitus (1), hypothyroidism (1), and amenorrhea-galactorrhea (4). Normal cerebrospinal fluid was found in 52% and an inflammatory profile in 48%. Only four recurrent ONM white patients had brain and spinal cord magnetic resonance imaging and cerebrospinal fluid findings compatible with the diagnosis of multiple sclerosis. Large lesions were seen in 62% of spinal magnetic resonance images. Six of 12 recurrent ONM Afro-Brazilian died. There were no statistical differences in the demographic data of the two ethnic groups. Afro-Brazilians were significantly more severely impaired and had a higher mortality rate than the white patients. Conclusion: These cases were classified as follows: two monophasic acute disseminated encephalomyelitis; one recurrent disseminated encephalomyelitis; three recurrent ONM associated with Hughes syndrome, autoantibodies and polyarteritis nodosa; six recurrent ONM with endocrinopathies; and finally, four muliple sclerosis cases. The remaining cases were not associated with any other condition. It would seem clear that ONM is a syndrome rather than a single disease. The nosological situation of Devic's disease or optic neuromyelitis (ONM) has been the subject of much controversy. A single case of subacute myelitis followed by optic neuritis, without necropsy confirmation, was described by Eugene Devic in 1894.1 It should be noted that the loss of deep tendon reflexes suggests that this was a case of disseminated demyelinaton also involving the peripheral nervous system and not multiple sclerosis (MS). He cited an unpublished thesis of Gault giving no details and a paper by Schanz,2 an ophthalmologist who mentioned several instances of the combination of various ill defined conditions affecting both the optic nerves and the spinal cord. A relapsing form was reported in 1927, by Beck.3 At the present time ONM or Devic's syndrome is defined as consisting of transverse myelitis (TM), unilateral or bilateral optic neuritis (ON), occurring simultaneously or delayed in time by weeks, months or years, with a monophasic or a relapsing remitting clinical course.4 ONM represents the common phenotype 5 of different underlying pathological events: inflammatory primary demyelinating diseases of the central nervous system (CNS),4 acute or recurrent disseminated encephalomyelitis (ADEM, RDEM),6 specific connective tissue disorders,7 pulmonary tuberculosis,8 and Hughes disease.9,10 Poser believes that multipe sclerosis (MS) is very rarely the cause of Devic's syndrome 6 although recurrent ONM (RONM) patients may fulfill the criteria for clinically definite MS.11 RONM is a rare disorder that closely resembles MS. Recently, Vernant et al12 reported a new syndrome of recurrent ON with endocrinopathies in eight black Antillean women from Martinique and Guadaloupe. The aim of this study is to define the nosological situation of ONM on the basis of the clinical, laboratory, and demographic features of 24 Brazilian patients with ONM, in order to determine if ONM, the Devic syndrome is a subtype of MS, a distinct disease, or a fragment of disseminated encephalomyelitis. Twenty four patients with the ONM syndrome treated at the Hospital da Lagoa, Rio de Janeiro in the period 1995–99 were selected from patients with demyelinating inflammatory diseases and included in this study. Their demographic, clinical, MRI, cerebrospinal fluid (CSF), and pathological features were analysed in relation to demyelinating events and associated illnesses. Clinical analysis was also performed, based on the last follow up year 2001. The inclusion criteria were: the occurrence of one or more bouts of ON and TM with no clinical evidence of other involvement of the CNS; normal MRI and CSF, or MRI and/or CSF findings clearly compatible with a demyelinating event. A bout was defined as a neurological dysfunction lasting more than 24 hours. Remission was definite improvement of signs, symptoms or both that had been present for at least 24 hours, lasting at least one month to be considered significant.11 Bouts were classified as: unilateral or bilateral ON, TM as complete (CTM) or partial (PTM), and as ONM when the clinical events ON and TM occurred simultaneously. Impairment and disability were rated according to Functional Systems (FS) and Expanded Disability Status Scale (EDSS).18 All patients were given the following tests: standard haematological tests, antinuclear antibody, rheumatoid factor, thyroid thyroglobulin, thyroid microsomal, and antiphospholipid antibodies, HIV-1 and HTLV-I serology. Clinical and laboratory screening for endocrinopathies and tuberculosis was also performed. Women patients were specifically asked about galactorrhea and amenorrhea unrelated to pregnancies. CSF was analysed in all patients: total and differential cell count, microbiological and fungal cultures. Albumin and IgG concentrations in serum and in CSF were determined by nephelometry. CSF blood-brain barrier function was based on the albumin quotient (CSF albumin/serum albumin). The IgG index (CSF IgG/serum IgG:CSF albumin/serum albumin) was used to determine the intrathecal synthesis of total IgG. Local synthesis of IgG was also evaluated by isoelectric focusing for the presence of oligoclonal bands. Two or more bands restricted to CSF, or additional bands in CSF compared with serum were considered as indicative of intrathecal synthesis of IgG. The presence of antibodies against HIV, HTLV-1, treponema pallidum, herpes simplex virus, varicella zoster virus, cytomegalovirus, and cysticercosis was looked for in CSF. Brain MRIs were obtained (1.5 Tesla GE Signa Horizon) in 21 of 24 patients, and double dose contrast CT scans were obtained for the other three. Brain MRIs were classified according to Paty et al19: I: strongly suggestive of MS, II: suggestive of MS, III: possible MS, IV: one lesion only, V: normal or other lesions. The extent and type of spinal cord MRI lesion were classified as follows: A1: large lesion (more than three segments) with cord swelling, A2: large lesion with cavitation, A3: severe atrophy, B: one small lesion, C: several small lesions, D: normal. Demographic and clinical data were collected and analysed according to SIAPEM, the Brazilian database for MS.20 The χ2 and Fisher's exact tests were done for dichotomous variables in Epi info 6. Necropsy was carried out on two patients. Twenty women and four men with ONM, 10 white and 14 Afro-Brazilian; 83% were born in the south eastern region of the country. The age at onset ranged from 14–55 years, mean 32.8 (10). There were no statistical differences in the demographic data of the two ethnic groups (see table 1). Monophasic in three patients (one white and two Afro-Brazilians) and recurrent (RONM) in 21. The number of bouts at inclusion were 104, with 1 to 12 bouts per patient, mean 4.3 (2.5); median 4. After a mean duration of disease of 7.7 (8.2) years, visual deficit was present in 20 patients: bilateral blindness in 10 (41% of all patients) and unilateral in six (20 %). A pyramidal syndrome was observed in 16 patients (66 %), five with paraplegia and four with quadriplegia. The frequency of motor impairment was the same in the two ethnic groups but it was much more severe in the Afro-Brazilians (p=0.01). Sensory impairment occurred in 16 patients (66%), five of them with anaesthesia of the lower limbs up to a thoracic level, and of the entire body in one. Sphincter disturbances were noted in 14 patients (58 %), six requiring permanent bladder catheterisation. Sensory (se), sphincter (sp), and visual (vi) impairment were also more frequent and more severe in the Afro-Brazilian group (FS-sensorial: p=0.005, p=0.01; FS-bowel and bladder: p=0.01, p=0.007; FS-visual: p=0.02 and p=0.01). Seven patients were mildly disabled (EDSS <3.5); seven moderately (EDSS 4–5.5), and 10 severely disabled (>6). Three patients were confined to wheelchair and six bedridden. Mild disability was more frequent in the white group (p=0.004) and severe disability in the Afro-Brazilian patients (p=0.007). The 24 ONM patients were prospectively studied (1995–2001) for one to five years. 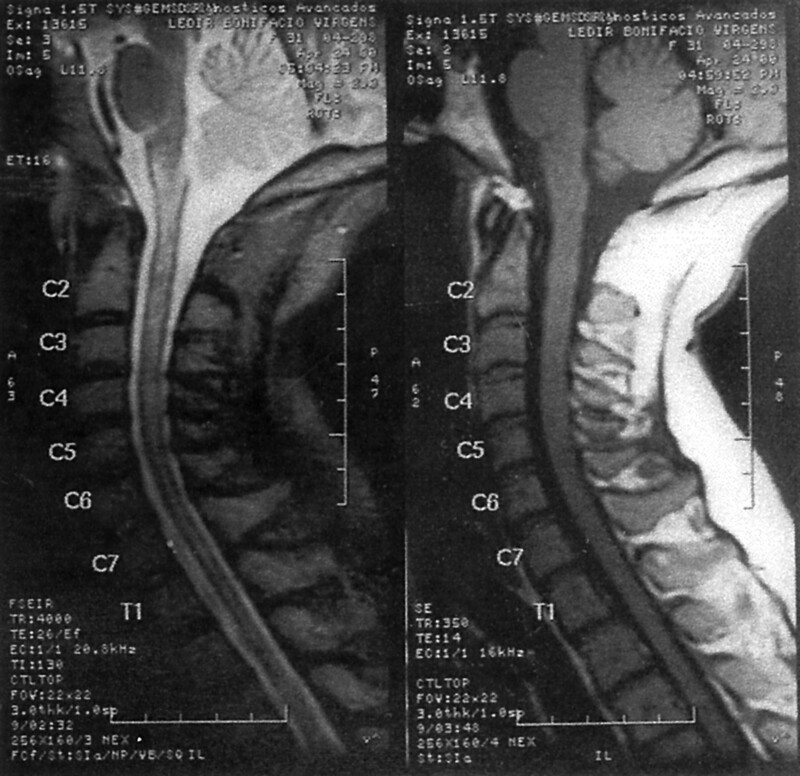 Patients with a monophasic course: case 1: only mild disabled 14 years after onset; case 21: blind but walks with unilateral support; case 11: an Afro-Brazilian woman had a new bout of unilateral ON after 20 months of disease, and was reclassified in the recurrent group. The 22 RONM cases from 1995 to 2001 had a total of 51 new bouts, the EDSS scores increased in cases 3, 7, 11, 13, and 24, and six Afro-Brazilian women died (cases 2, 4, 5, 18, 21, 22). The time from onset to death ranged from eight months to 30 years, mean 11.4 (12.3). In all six cases death resulted from respiratory arrest during a severe bout of quadriplegia. Necropsy was performed in cases 4 and 18.21 Nine of the RONM patients were afflicted with unilateral or bilateral blindness, in two of them associated with severe gait impairment, while two remain only mildly disabled (FS <3.5). Optic nerve atrophy accounted for the permanent visual loss in 63% of the patients, unilateral in 21%. and bilateral in 42%. The initial manifestations of ONM syndrome were TM in nine cases (37.5%), ON in eight (33.3%), and simultaneous TM and ON in seven (29.2%), the diagnosis of ONM being possible at onset only in the last group. The interval between the two index events (ON and TM) in ONM bouts occurred from one to 45 days (mean:20 (17.5), median:20). After remission of a first TM bout, ON occurred after 4 to 192 months (mean:75.1 (70.9), median: 36). In the patients with ON at onset, a second event of spinal cord occurred after 4 to 240 months (mean: 56 (75.5) median: 29). A total of 175 bouts were identified by anamnesis and from medical records (104 at inclusion and 51 at follow up): TM (56%), ON neuritis (24%) and ONM (18%). Myelitic bouts were more frequent in white patients (p=0.001) and ONM bouts in the Afro-Brazilian patients (p=0.003). In the two monophasic cases, the prior events were respectively pulmonary tuberculosis and upper respiratory infection, while in the RONM patients they were pulmonary tuberculosis (3), neurocysticercosis (1), polyarteritis nodosa (1), high levels of antinuclear antibody and rheumatoid factor (1), antiphospholipid antibody syndrome (1), diabetes mellitus (1), hypothyroidism (1), fever (1) and the amenorrhea-galactorrhea syndrome (4). Brain MRI (table 3) was normal in 62% of 21 patients. Large demyelinating lesions typical of ADEM 22 were found in the white matter of the parietal lobe, brain stem, and spinal cord of one ONM monophasic patient (case 21), who also had the diagnosis of pulmonary tuberculosis. Lesions suggestive of MS (Paty II or Paty I) were observed in four instances (19%). The most frequent finding consisted of large, T2 weighted areas of increased signal intensity (AISIs) more than three segments in length, central cavitation or severe atrophy (13 cases, 62%). Small T2 AISIs as seen in MS were found in four cases (19%). A normal cervical spinal cord MRI was found in two cases: in an ONM monophasic patient after a follow up of 10 years (case 1) and in a quadriplegic RONM after intravenous treatment with high doses of corticosteroids (case 22). Fourteen CSF samples were normal (52%). There was pleocytosis in nine, only one with more than 50 cells, increased protein concentration in 11, blood-CSF barrier dysfunction in two of 18, high IgG index in one of 20, and oligoclonal bands in five of 23 instances. Subsequent CSF analysis during remission showed normalisation of both pleocytosis and protein content in four cases. Changes in CSF parameters during bouts and remissions are shown in table 5. There was a decrease of the inflammatory pattern during remissions. Postmortem examination was done in cases 18 and 4. Case 18 was a 25 year old Afro-Brazilian woman who died during her third bout, after eight months of disease. She was found to have pulmonary tuberculosis a few days before death. There was severe inflammatory damage of the spinal cord and optic nerves. The lesions consisted of destruction of the white matter with cavitation, many microglial cells and rare lymphocytes. The brain showed no macroscopic changes but microscopic study revealed small foci of demyelination in the corpus callosum and lower medulla.21 The second patient (case 4) was an Afro-Brazilian woman who died with nosocomial pneumonia after 30 years of recurrent ONM. Severe demyelinating lesions were found in the spinal cord and optic nerves. 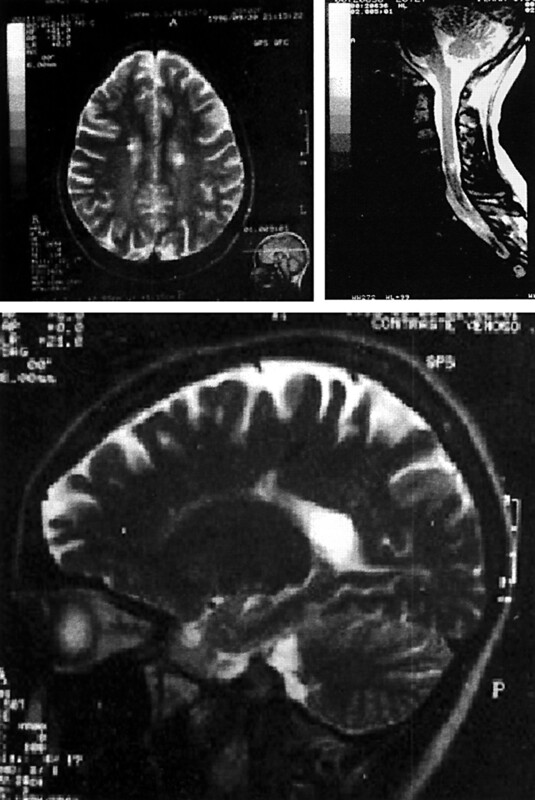 A brain MRI (fig 1) one week before death showed small lesions in the cerebral white matter (Paty II), without enhancement after contrast administration, that corresponded with the areas of demyelination found at necropsy (fig 1). Cranial MRI and necroscopic examination of the brain and spinal cord. Case 14: a 44 year old Afro-Brazilian woman with death after 30 years of recurrent ONM syndrome. 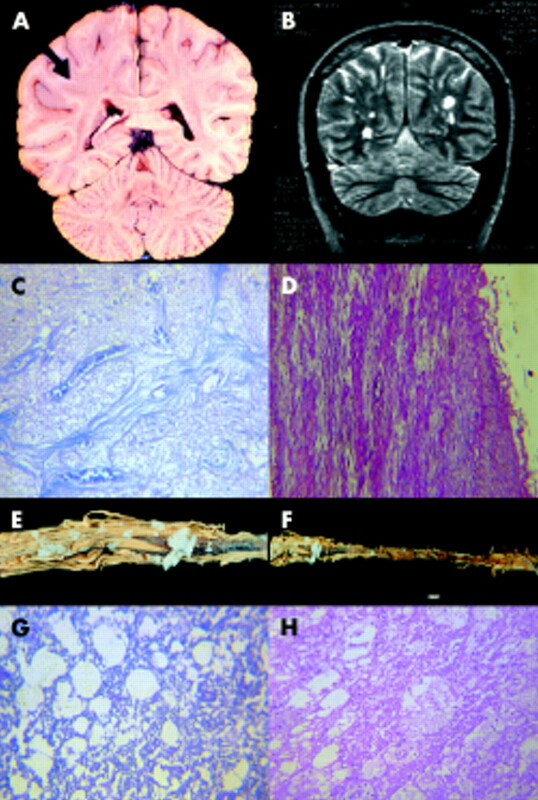 (A) Posterior coronal cut of the brain; (B) MRI-T2 posterior coronal view; (C) microscopy of optic chiasma (Luxol fast blue); (D) microscopy of optic nerve (haematoxylin and eosin); (E) macroscopy of spinal cord; (F) macroscopy of spinal cord (atrophy); (G) microscopy of spinal cord (Luxol fast blue); (H) microscopy of spinal cord (haematoxylin and eosin). Case 9 (ONM/MS patient) MRI showing small periventricular T2 images (Paty II) and small spinal cord lesions. There were important differences in the CSF findings between our ONM patients and those with definite MS: mild pleocytosis and increased CSF protein content were more common in ONM and increased IgG indices and oligoclonal bands, which occurred in 85% of the clinical definite MS Brazilian patients,24 were very rare. Compared with MS where the CSF changes are independent of the activity of the disease, in ONM all the CSF abnormalities (pleocytosis, high level of protein, high IgG index, and oligoclonal bands) disappeared during remission in the majority of the cases. In contrast with the study on ONM by Wingerchuk et al,15 we found pleocytosis of more than 50 cells/mm3 in only 4% of our CSF analyses, and protein concentration higher than 70 mg/dl in only 15%. Another important clinical difference between Brazilian RRMS23 and ONM Brazilian patients is the degree of impairment and disability on follow up. There is a statistically significant difference between the EDSS and the FS scores: higher impairment and more disability in the ONM group (fig 3). Comparison of impairment and disability (FS/EDSS-KURTZKE) between Brazilian multiple sclerosis patients with relapsing remitting course and ONM patients (FS-Pyr—pyramidal/ FS-Sen—sensory/ FS-BB—bowel and bladder). 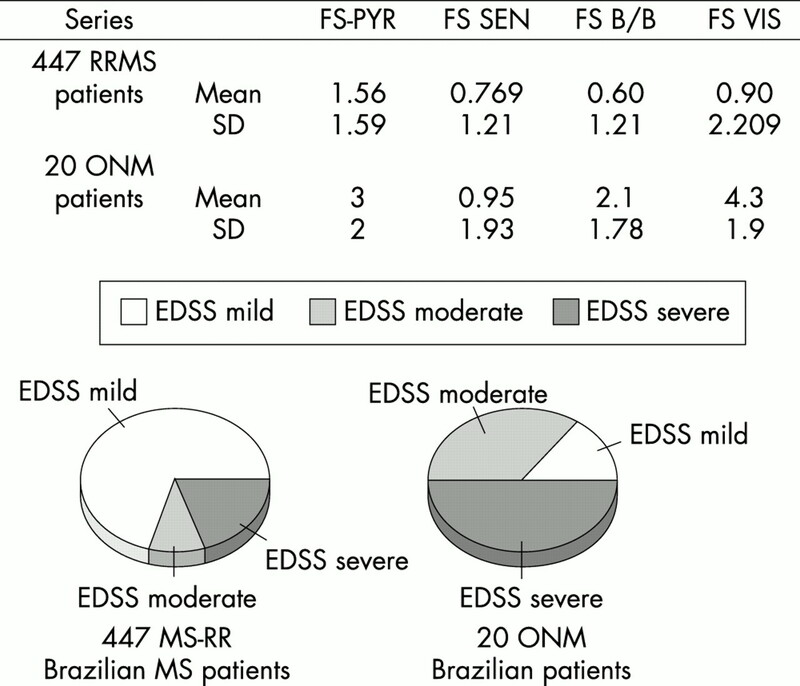 (A) Disability by EDSS: RRMS—447 Brazilian patients—South Atlantic project. ONM—20 ONM Brazilian patients (excluded ONM/MS patients—cases 3, 9, 13, 17); (B) Impairment by FS: RRMS—447 Brazilian patients—South Atlantic project. ONM—20 ONM Brazilian patients (excluded ONM/MS patients-cases 3, 9, 13, 17). The pathological features and the MRI can be helpful in differentiating ONM from MS. Necropsies of five ONM patients reported by Mandler et al13 demonstrated extensive, severe necrotising myelopathy, with thickening of blood vessels but without lymphocytic infiltrates and prominent necrosis of gray and white matter with cavitation, affecting only the optic nerves and the spinal cord. The authors emphasised the importance of a normal brain MRI in the in vivo diagnosis of ONM. Brain images, which were normal at disease onset, may show demyelinating lesions after long evolution 15 as exemplified by case 4. MRI extension of the cervical lesions into the brain stem occurred in cases 5, 11, and 12 like those noted by Wingerchuck et al.15 One such example is case 11, a 25 year old Afro-Brazilian woman with fever, malaise, galactorrhea, and amenorrhea, who developed urinary retention followed by subacute quadriparesis and bilateral optic papilitis with unilateral loss of vision. During the acute phase, she exhibited bulbar signs (deviation of the tongue and hiccups), and MRI showed a large cervical lesion extending into the medulla oblonga (fig 4). Case 11: ONM bout in an Afro-Brazilian woman—MRI showed a large cervical T2 lesion extended into the medulla oblonga, with no expresion in T1. Monophasic Devic's syndrome probably represents a fragment of acute disseminated encephalomyelitis (ADEM).6 Our two monophasic ONM patients had a previous history of infectious diseases: an acute respiratory infection (case 1) and pulmonary tuberculosis (case 21). The diagnosis of ADEM in this 48 year old Afro-Brazilian was confirmed by the presence of large brain and spinal cord lesions in MRI images (fig 5). We also found evidence of active pulmonary tuberculosis (by chest radiograph, sputum analysis, and bronchoscopy) in RONM cases 4 and 6. Sporadic reports of patients with ONM in association with pulmonary tuberculosis have been published: Silber et al8 described eight patients, with severe disease and poor neurological recovery. The failure to demonstrate mycobacterium in the CSF or in the CNS at necropsy suggests that the ONM results from an immune reaction triggered by a specific antigenic stimulus. In many cases of ADEM the preceding infection may be very mild so that is not mentioned, or has been forgotten, or was actually subclinical and unrecognised. It is also well known that prior vaccinations are often not mentioned by the patient, or not asked about by the doctor, especially as there is so much emphasis by public health authorities that vaccines are perfectly safe and do not cause ADEM. Case 21: Monophasic Devic's syndrome—the neurological presentation of acute disseminated encephalomyelitis (ADEM).The diagnosis of ADEM was confirmed by the presence of large brain and spinal cord lesions at MRI. Recurrences of bouts of neurological dysfunction have almost invariably been ascribed to MS but such events also can be seen in recurrent (RDEM) and multiphasic disseminated encephalomyelitis (MDEM).6 In RDEM the first, acute bout is followed by one or more episodes that reproduce all or some of the symptoms of the original episode; this symptomatic stereotype that is quite rare in MS, can be seen in some cases of RONM.6 Our case 7 is a good illustration of this type of illness: a 55 year old Afro-Brazilian woman was treated with praziquantel for cerebral cysticercosis one year before the onset of RONM. She developed a subacute episode of TM at the T4 level and partial bilateral visual loss, with complete remission after corticotherapy. This first episode was then followed by seven episodes in the subsequent eight years, each one reproducing all or some of the symptoms of the original attack, mimicking the description of RDEM.6 Brain MRI revealed only one small periventricular lesion (Paty IV). A small enhancing demyelinating lesion was seen at the T4 level and extensive spinal cord atrophy was demonstrated after eight years of disease. A special group of RONM cases associated with endocrinopathies was first described by Vernant et al.12 The first Brazilian report of this new syndrome was published in 1999 26 and is case 16 in this series: a 44 year old black woman had three episodes of ONM in a 14 year period, one of them associated with amenorrhea and galactorrhea. Cervical spinal cord MRI showed a large lesion with syringomyelic cavitation, but normal brain images. Three more Afro-Brazilian women, and one white woman in our series have also developed endocrine disturbances: amenorrhea-galactorrhea (cases 7 and 11), hypothyroidism (case 5), and diabetes mellitus (case 20), associated with severe motor and visual deficits, large spinal cord lesions and normal brain MRIs. Interestingly, a ONM-MS case (9), also had galactorrhea and amenorrhea with an increased prolactin level before and after the third bout, which disappeared after corticotherapy. We have also found ONM to be associated with connective tissue disorders: a 39 year old white woman (case 15) presented with sudden loss of vision and papillitis in the left eye. She failed to respond to treatment with methylprednisolone. Six months later, she complained of acute pain in the right eye, followed by loss of vision rendering her completely blind. Two years afterwards she developed paraplegia with a T10 sensory level, also without recovery. Spinal cord MRI showed a large lesion of the thoracic spinal cord. Polyarteritis nodosa had been diagnosed 10 years before, when she was found to have severe hypertension, peripheral neuropathy, joint pains, fever, and hair loss. Nerve biopsy revealed vasculitis. Anticardiolipin antibodies were not present. The patient had been treated for lung tuberculosis at the age of 18. Our results are in agreement with the Mayo Clinic study 15 that discarded the general idea that monophasic severe bilateral ON and TM occurring within a brief time interval is essential for the diagnosis of ONM. Indeed, only one of our patients met that criterion. Our series of patients with ONM consisted of two monophasic cases of ADEM, one of RDEM, one case each of RONM associated with antiphospholipid antibodies, autoantibodies, and polyarteritis nodosa, and six cases of RONM with endocrinopathies. Four cases were diagnosed as definite MS. Finally, eight ONM cases with recurrent course, the disease affected only the CNS system with no evidence of other associated disease. ONM patients had more severe impairment and disability when compared with Brazilian RRMS patients of the South Atlantic Project, and Afro-Brazilian patients with RONM had a worse prognosis with high morbidity and mortality. We can infer from our series that ONM is a syndrome rather than a single disease, and suggest that the term Devic's disease should be abandoned. It is clear that a number of conditions are associated, or result in ONM, and that the common practice of including such cases as variants of MS is inappropriate as only four, one sixth of our cases, qualified as such. Furthermore, it is noteworthy that 12 of our patients had what one might describe as fragments of one or another form of disseminated encephalomyelitis. Devic E. Myelitis subaigue compliquee de nevrite optique. Bull Med1894;8:1033–4. Schanz F. Ueber das Zusammenvorkomnen von Neuritis optica und Myelitis acuta. Dtsch Med Wchnschr1893;19:615–17. Beck GM. A case of diffuse myelitis associated with optic neuritis. Brain1927;50:687–703. Weinshenker B. Epidemiology of multiple sclerosis. Neurol Clin1996;14:291–308. Scolding N. Immunological and inflammatory disorders of the central nervous system. Cambridge: Butterworth Heinemann,1999;3:74–92. Poser CM. The epidemiology of multiple sclerosis. Ann Neurol1994;36 (suppl 2):S180–93. April RS, Vansonnenberg E. A case of neuromyelitis optica (Devic's syndrome) in systemic lupus erithematosus. Neurology1976;26:1066–70. Silber MH, Willcox PA, Bowen RM, et al. Neuromyelitis optica (Devic's syndrome) and pulmonary tuberculosis. Neurology1990;40:934–8. Karussis D. A subgroup of multiple sclerosis patients with anticardiolipin antibodies and unusual clinical manifestations: do they represent a new nosological entity? Ann Neurol1998;44:629–34. Quadrado MJ, Khamashta MA, Ballestero A, et al. Can neurologic manifestations of Hughes (antiphospholipid ) syndrome be distinguished from multiple sclerosis? Vol 70 (number 1). In: Medicine. Baltimore: Lippincott Williams and Wilkins, 2000:57–68. Poser CM, Paty DW, Scheinberg L, et al. New diagnostic criteria for multiple sclerosis: Guidelines for research protocols. Ann Neurol 1983;13:227–31. Vernant JC, Cabre P, Smadja D, et al. Recurrent optic neuromyelitis with endocrinopathies: a new syndrome. Neurology1997;48:58–64. Mandler RN, Davis LE, Jeffery DR, et al. Devic's neuromyelitis optica: a clinicopathological study of 8 patients. Ann Neurol1993;34:162–8. O'Riordan JI, Gallagher L, Thompson AJ, et al. Clinical, CSF and MRI findings in Devic's neuromyelitis optica. J Neurol Neurosurg Psychiatry1996;60:382–7. Wingerchuck DM, Hogancamp WF, O'Brien PC, et al. The clinical course of neuromyelitis optica (Devic's syndrome). Neurology1999;53:1107–14. Mirsattari S, Joshnston J, McKenna R, et al. Aboriginals with multiple sclerosis. Neurology2001;56:307–23. Poser C. The pathogenesis of multiple sclerosis. A commentary. Clin Neurol Neurosurg2000;102:191–4. Kurtzke JF. Rating neurological impairment in multiple sclerosis: an expanded disability status scale (EDSS). Neurology1983;33:1444–52. Paty DW, Oger JJF, Kastrukoff LF, et al. MRI in the diagnosis of MS: a prospective study with comparison of clinical evaluation, evoked potentials, oligoclonal bands and CT. Neurology1988;38:180–5. Alvarenga RMP, Alves SV, Santos CMM, et al. SIAPEM, a Brazilian and South American database for multiple sclerosis. J Neurol Sci1997;50 (suppl 1):S187. Colin D, Monteiro G, Basílio de Oliveira CA, et al. Neuro optic myelitis: histopathological study and the analysis of the prevalence in demyelinating disease. J Neurol Sci1997;50 (suppl 1):S229. Poser CM. An atlas of multiple sclerosis. Carnsworth, UK: Parthenon Publishing, 1998. Papais-Alvarenga RM, Alves Leon SV, Miranda Santos CM, et al. Characteristics of multiple sclerosis in Brazil. A multicentric study in a prevalence cohort. South Atlantic Project. 1995–1998. J Neurol Sci2001;187 (suppl 1):S344. Puccioni-Sohler M, Passeri F, Oliveira M, et al. Multiple sclerosis in Brazil. Analysis of cerebrospinal fluid by standard methods. Arq Neuro Psiq1999;57:927–31. Caballero A, Alves-Leon SV, Papais-Alvarenga RMA, et al. DQB1*0602 confers genetic susceptibility to multiple sclerosis in Afro-Brazilians. Tissue Antigens1999;54:524–6. Alvarenga RMP, Santos CMM, Poser CM. Recurrent neuro optic myelitis (NOM) with endocrinopathies. Report of one case in Brazil. Multiple Sclerosis1999;5 (suppl 1):S280. This study was presented in part at the 16th annual meeting of the European Committee for Treatment and Research in Multiple Sclerosis (ECTRIMS), Toulouse, France, 6–9 September 2000.